The Target Marketing Systems Tall Storage Cabinet with 2 Adjustable Top Shelves and 1 Bottom Shelf is Here to Make Your Life Easier and More Organized. Featuring 2 Adjustable Top Shelves and 1 Bottom Shelf, the Cabinet has More than Enough Space for Your Items. Whether You Need a Place to Store your Extra Towels and Linens or You Need More Room for Your Kitchen Items, the Storage Cabinet is the Perfect Piece for You. Now You'll Have a Place for All your Goods without having to Wonder Where you Last Placed it. Made from Solid High Quality Wood, the Cabinet is Sturdy and Durable. The Cabinet also has a very Classic Design, allowing it to Seamlessly Fit in to Your Home's Style. Since 1985, Target Marketing Systems has been Offering Top-Notch Furniture at Affordable Prices. That Goal has not Changed and TMS will Continue to Give You the Best. The Storage Cabinet Measures 23" X 12" X 48" and Weighs 46 Lbs. Arrives with Only Minimal Assembly Required. 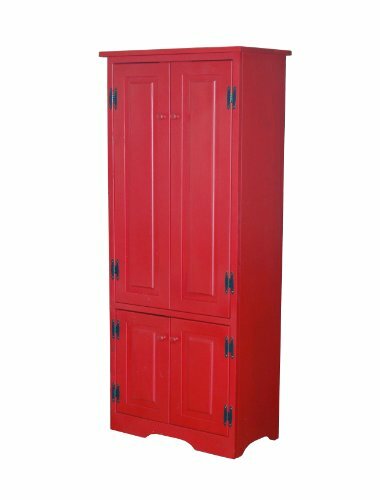 Perfect for the Kitchen, Laundry Room and Bathroom, the Storage Cabinet isn't Meant for Just One Room. Need Somewhere to put Extra Towels or a Place to Store your Fine Dining Place Setting Items? The Tall Cabinet is the Piece You Need. With Subtle Design Elements, the Cabinet Seamlessly Fits in with Any Home Décor. The Differing Color on the Cabinet Door Hinges Enhance the Look of the Storage Cabinet. Made from a High Quality Wood, the Storage Cabinet with Doors and Shelves is Manufactured to Last. Built to Withstand Everyday Use, the Cabinet is also Easy to Clean and Maintain. Innovation, Quality and Affordability have been Primary Goals of Targeting Marketing Systems Since 1985. Trust TMS to Bring a Practical and Elegant Enrichment to Your Home. If you have any questions about this product by Target Marketing Systems, contact us by completing and submitting the form below. If you are looking for a specif part number, please include it with your message.